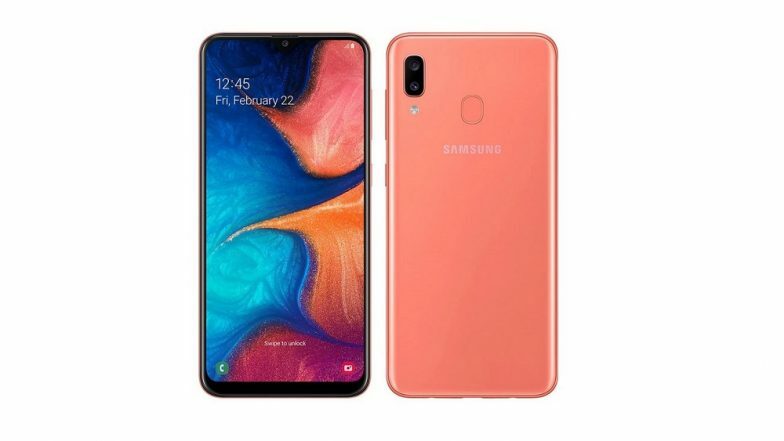 New Delhi, April 5: With an aim to disrupt the budget smartphone segment in India, Samsung on Friday launched Galaxy A20 dual rear camera phone for Rs 12,490. Galaxy A20 comes with 6.4-inch HD+ Infinity-V Super AMOLED display and houses a 4,000mAh battery with fast charging capability. The phone sports a 13MP +5MP dual rear camera and an 8MP selfie camera. Samsung Galaxy A20e Render Image Surfaces Online; Likely To Be Unveiled on April 10 As Toned Down Version of Galaxy A20e. The phone is powered by an Exynos 7884 Octa-core processor and comes with 3GB RAM and 32GB internal memory. The phone will be available starting on April 10 on the Samsung e-Store, Samsung Opera House, leading e-commerce portals and retail stores across the country, Samsung said. Galaxy A20 will come with the latest Android Pie and Samsung One UI, the South Korean tech giant said, adding that the phone will be available in three colours - red, blue and black.